Hollywood constantly churns out sequels to box office smashes. 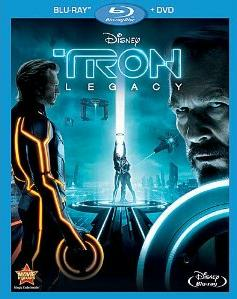 But with TRON: Legacy, the industry waited nearly three decades to revisit a film initially deemed a dud. The result proved superior to the source material, although its dehumanized storytelling too often reflected the circuits at its core. Legacy follows Sam (Garrett Hedlund), the son of the original TRON's heroic Flynn (Jeff Bridges), as he is sucked into the same grid that took his daddy years ago. Sam reunites with an older, more Zen-like Flynn (Bridges again), and the duo must battle Clu, Flynn's evil doppelganger with designs on following Sam and Flynn back to the real world with an army in tow. It's hard to be bowled over by special effects these days, but the grid world shown in Legacy is still a jaw-dropping achievement. Clu, a computer animated version of Bridges circa 1982, isn't quite as successful, but it's certainly good enough to give the villain a pulse. Charismatic turns by co-stars Olivia Wilde and Michael Sheen add a dose of fun to the proceedings, while Bridges' Dude-speak brings warmth to a rather cold environment. The Blu-ray goodies include "The Next Day: Flynn Lives Revealed," which fleshes out the "Tron" saga courtesy of flashbacks, interviews and a Banksy-style character with the unstated goal of sparking new "Tron" chronicles. Other extras include "Launching the Legacy," the Daft Punk music video "Derezzed" and "Installing the Cast." Buy the TRON: Legacy Blu-ray package and receive the original TRON, making its Blu-ray debut, as well as a 3-D version of Legacy and a host of informative extras. The 1982 film TRON is more of a technical milestone than a narrative triumph. The story of a maverick game designer (Bridges) who hacks into the mainframe of his ex-employer's system can be clunky and episodic. But it was so far ahead of its time that watching it anew can be compelling without fully buying into the concept. The TRON Blu-ray extras include some frank interviews with the original cast. "I didn't understand a word of it," says the man who played Tron, Bruce Boxleitner, regarding his first reaction to the TRON script. The name "Focker" is no longer funny, a fact which eluded the minds behind the third film in the Meet the Parents trilogy. Little Fockers finds Greg Fokker (Ben Stiller) dealing with the pressures of parenthood as well as a father-in-law (Robert De Niro) eager to name a patriarch, or "Godfocker," to oversee the brood. Along the way Greg endures the flirtations of a Viagra-style product saleswoman (Jessica Alba), a child with a knack for projective vomiting and the prospect of entering his kids into a prestigious school dubbed "Early Humans Academy." It's a dispiriting affair which gathers so much talent—including Dustin Hoffman, Barbra Streisand, Owen Wilson and Harvey Keitel—in the service of a flat and strained comedy. Stiller manages to keep his composure and, more remarkably, his dignity. And Wilson's soulful shtick elicits a grin or two, even if his character's arc remains absurd. The Blu-ray extras feature dual interviews with Stiller and De Niro as well as Stiller and Wilson, the latter having worked on screen together 10 times counting their "Fockers" follow-up. Russell Brand may be a livewire comic actor, but he'll have a hard time following in Dudley Moore's wobbly footsteps as one of cinema's greatest drunks. The 1981 comedy Arthur hits Blu-ray for the first time this week to coincide with Brand's remake, packaged along with its inferior sequel, Arthur 2: On the Rocks. Moore's Arthur "races cars, plays tennis, fondles women," and so on, and he's also an unapologetic drunk. His wealthy family threatens to cut him off the financial teat unless he marries Susan (Jill Eikenberry), a pretty, respectable woman of similar means. But when Arthur meets Linda (Liza Minnelli), a spunky girl with a knack for shoplifting, money suddenly doesn't seem so important. Alcoholism is a far trickier subject to tackle on screen these days, and it's hard to watch a scene in which an inebriated Arthur races down a highway. But the film otherwise has aged gracefully, especially the withering lines delivered by Sir John Gielgud, who won an Oscar for playing the droll Hobson. Moore makes Arthur's cackling laugh and endless banter appealing, and writer/director Steve Gordon, who died shortly after making the film, gives the leads a treasure trove of great dialogue. Gordon's comic direction is perfection, and the game cast makes every zinger pop. The sequel boasts a great title, but not much else to recommend it. A business swindle leaves Arthur penniless, but he still has Linda and an indomitable spirit. The project feels more like an Arthur sitcom in its fifth season, rather than a respectable companion piece, but those who can't get enough of a tipsy Moore may still be satisfied. I Love You Phillip Morris bounced around the theatrical release schedule like a future Razzie nominee, but it‘s actually one of Jim Carrey‘s more challenging performances. Carrey stars as Steve, a closeted gay man who decides to stop living a lie after surviving a car accident. He ditches his wife (Leslie Mann) only to discover the lavish lifestyle he craves doesn't come cheaply. So he flim-flams his way to prosperity and ends up getting thrown in jail as a result. It's in prison where he meets Phillip (Ewan McGregor), a shy gay man with a good heart. The two fall madly in love, but every time it seems they're destined to be together Steve's con man behavior break them apart. Phillip Morris is certainly bawdier than most of Carrey's past comedies, and the unexpurgated sexual situations may make Ace Ventura fans blush. But the story is based on true events, and Carrey manages to mine big laughs within that framework. What's missing here is the love story. Carrey and McGregor make an appealing couple on the surface, but it's hard to see the spark at play. Carrey is simply too manic, while McGregor is so reserved he's practically asleep at times. In a "Making Of" featurette, Carrey explains his love/hate/love/hate relationship with his character. And the deleted scenes add even more sexually suggestive exploits while revealing how Carrey can mine laughter out of the simple actor addressing his "in" box at work.